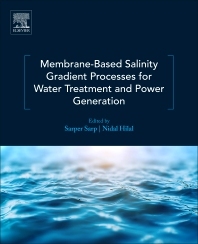 Membrane-Based Salinity Gradient Processes for Water Treatment and Power Generation focuses on the various types of membrane- based salinity gradient processes that can be applied for desalination. Topics cover salinity gradient processes for desalination, such as Forward Osmosis (FO) and Pressure Retarded Osmosis (PRO), with chapters selected exclusively from a number of world-leading experts in various disciplines and from different continents. Sections include discussions on the theoretical and fundamental approaches to salinity gradient processes, various types of membrane materials and development, i.e., flat sheet and hollow fiber, various salinity water sources for an economically feasible process, and large-scale applications. Finally, the book focuses on economically feasible process optimization when both operational and capital costs are considered. Dr. Sarper Sarp is a Lecturer in Chemical Engineering at College of Engineering, Swansea University (United Kingdom). Dr. Sarp also a member of internationally acclaimed Centre for Water Advanced Technologies and Environmental Research (CWATER) at Swansea University. His research interests include salinity gradient systems, micro-plastics in water sources, advanced oxidation processes, seawater pre-treatment, and solar desalination. Dr. Sarp is the author/co-author of over 25 peer-reviewed articles and 5 intellectual properties. He is also a member of the Editorial Board of Desalination Journal (Elsevier) and edited two special issues: Pressure Retarded Osmosis, and Desalination and Environment published by Desalination Journal, in early 2016.